Advisor to Prime Minister on Foreign Affairs Sartaj Aziz presided over the inaugural session of the Conference. 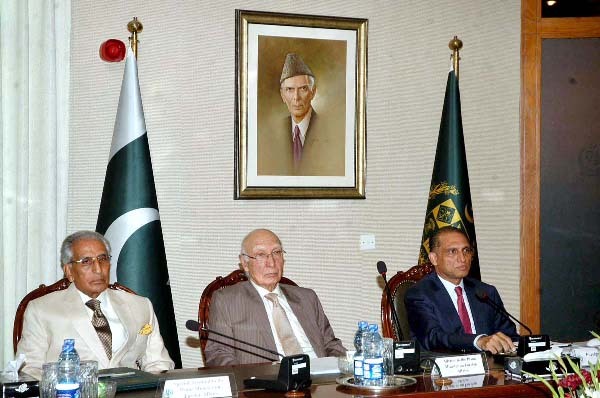 ISLAMABAD, Aug 1 (APP): A three-day Envoys’ Conference began Monday here at the Ministry of Foreign Affairs to discuss the country’s foreign policy and prepare recommendations in view of regional developments. Prime Minister’s Special Assistant on Foreign Affairs Tariq Fatemi and Foreign Secretary Aizaz were present. The nine envoys who are attending the session include Jalil Abbas Jilani (Washington DC), Masood Khalid (Beijing), Abdul Basit (New Delhi), Maleeha Lodhi (UN New York), Ayesha Riyaz (Vienna), Naghmana Hashmi (Brussels/EU), Abrar Hussain (Afghanistan), Tehmina Janjua (UN/Geneva) and Qazi M. Khalilullah (Moscow). The recommendations on foreign policy will be presented to Prime Minister Muhammad Nawaz Sharif who is also scheduled to address the concluding session of the Conference.